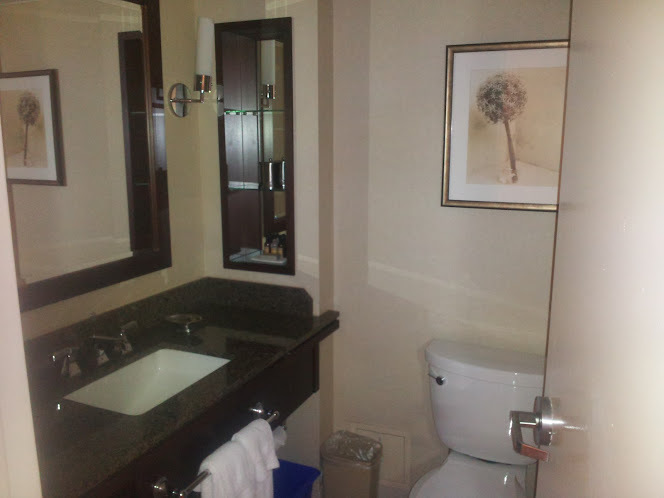 I consistently stay at Marriotts when I visit Toronto, but I don’t stay at the same Marriott. I like to mix it up a bit. I do this partly because I like to try new things, but mostly because I find the prices of hotels in Toronto to be too high and very inconsistent from year to year. For example a place that goes for $150CAD last August now goes for $240CAD — and the same hotel would have $190CAD two years before. The Toronto Marriott Bloor Yorkville Hotel came highly recommended from several of my more discerning travel colleagues. I was looking forward to this hotel, even though I don’t spend much time in any hotel while I travel – either for work or pleasure. We arrived at the hotel around midnight. 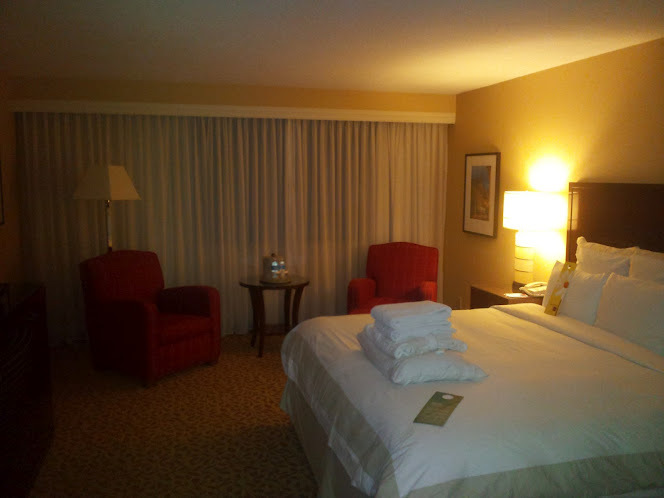 I had two rooms under my reservation, since my colleague doesn’t have a corporate credit card. I approach the desk and hand my identification, my Marriott Silver (ugh, not real status, I know) card and my corporate credit card. 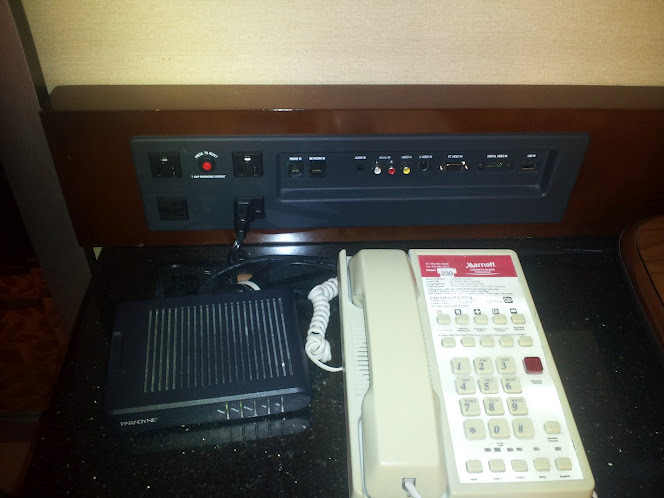 I ask about in-room wifi and the front desk agent said it is available, but only for an additional charge. Of course, I ask him if it can be included complimentary. He looks down and types for a while, then agrees. I clarify that it is for both rooms and with a big smile he says “yes”. I wasn’t expecting this, how nice. We are assigned rooms on the second floor, which is actually on the 7th floor of building. The hallways are long and covered with carpet that has seen better days. 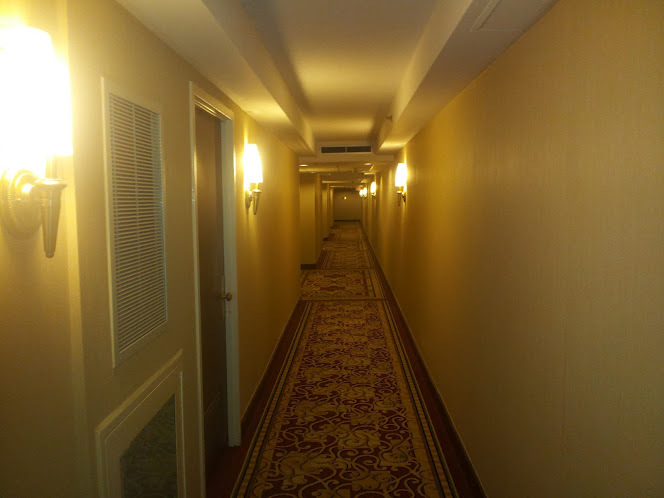 The pattern and the edges that were pulled up a bit made it look and feel like I was on a cruise ship — the hallways felt like we were on a moving boat. My room was large and clean. 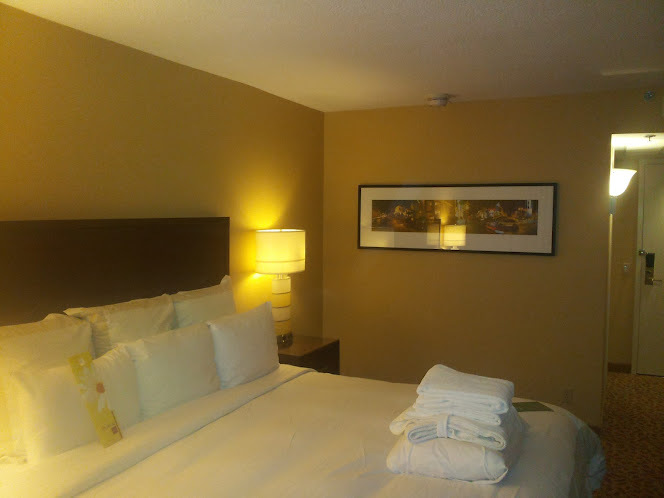 I was surprised to find the extra pillows and towels (that I have a standing order for) were actually in my room (they were in BOTH rooms under my name). Most times this request doesn’t get fulfilled. 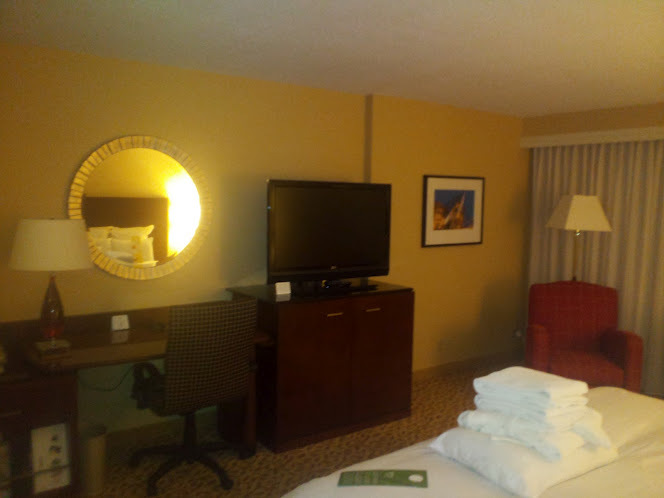 The room had a comfortable king bed, two club chairs near the window and an flat panel TV. Nicely done. 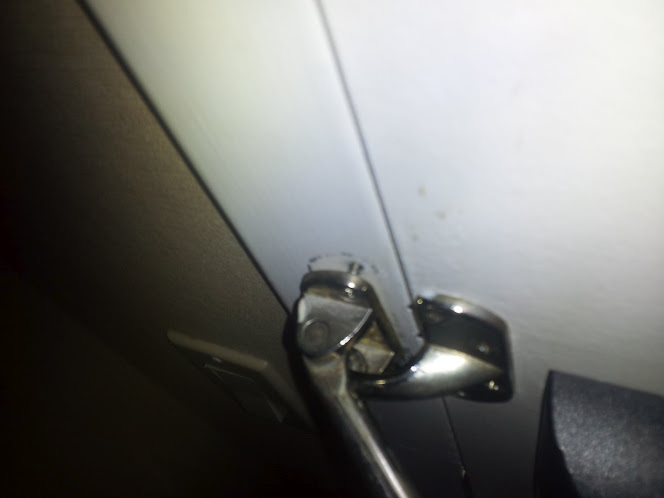 The secondary lock on the door was in poor repair. This would not keep an unwanted guest out of the room. Since we got in late and had to be up early I didn’t worry about this issue until the next morning. As I was leaving the hotel, I asked the people at the front desk to send someone up to fix the lock. Nothing was fixed. I do hope they fix this lock (in room 230). Guests safety should be a priority. The bathroom was a standard bathroom with the Bath and Body Works products, which I still love. 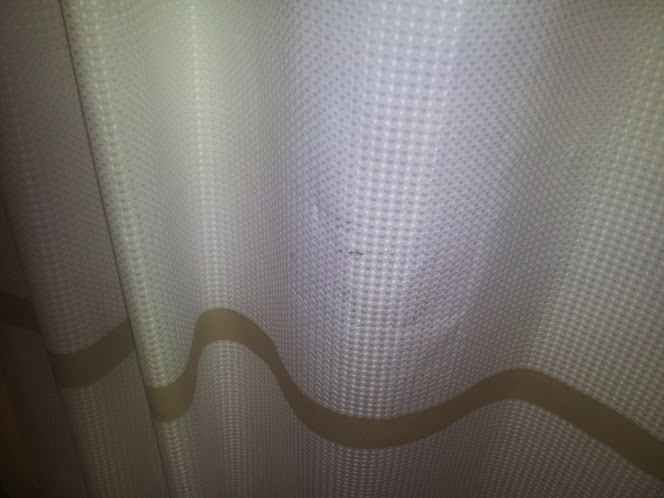 The only stain on the linens I found was what appeared to be a grease stain on the shower curtain. So much nicer than Westin Alexandria (read about that here). The water pressure was great and I always had hot water when showering. A must in a hotel, but it is surprising how frequently hotels do not deliver. 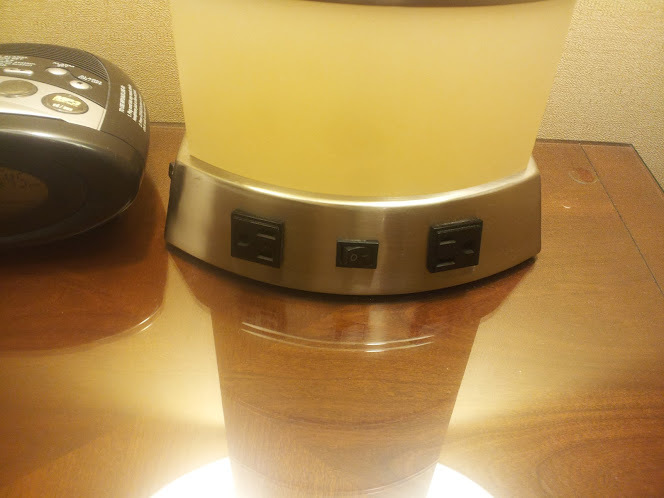 The room did have a good number of power outlets, including a double outlet on each nightstand. SCORE. God I hate when I have to crawl around on the floor to find an outlet to charge my electronic gear. Nice showing Marriott. While the hotel didn’t meet the expectations that my colleagues had set for me, it was a perfectly fine place to stay. I did have one issue that really takes this hotel down a notch for me. The hotel screwed up the billing of the rooms. As I said before, I had two rooms under my name, since one colleague doesn’t have a travel card. One of the rooms was billed to my corporate card and the other room billed to my personal card (that is tied to my Marriott Rewards Account). I presented my corporate card at check-in and indicated this was the card to use. The second issue is that we got one day of wifi free, but were charged for a second day. The first day showed up as “Internet – $0.00”, so it was on the folio as free. The second day, not so much. A few days after check-out I called to get the bill fixed. This is where the service fell apart. I got a hold of someone in accounting, but after explaining the issues she said she had no authority to make any changes and someone would call me back. I called again the following day and got the same woman. She apologizes for no one returning my call, but again her manager was unavailable. Since it was the Friday before a holiday weekend she said he wouldn’t be able to call me until the next week (he wasn’t gone for the weekend, just wouldn’t have time to call before he left for the weekend). I didn’t get a call on Tuesday either, so I called back again and was transferred to a new person who I had to leave a message with. He called me back the next day. He explained that the front desk guy didn’t have the authority to offer free Internet as that was only for Platinum Guests. I didn’t care what he had authority to offer, he offered it and it worked partially on the bill. Just fix it — and properly charge my cards, as I originally requested. It took another couple of days before this was rectified. The final issue, is the currency fluctuation. The charge errors resulted in me losing a couple bucks when the value of the dollar was lost. I emailed the hotel and asked for some additional Marriott points to make up for my minimal loss. They responded in less than 24 hours and offered me 3,000 points. Not a windfall, but a nice bit of help. It would have been wonderful if the hotel had proactively offered something, considering the issues. The real question: Would I stay at this hotel again? Probably. There are many Marriotts (and other chains) in the area of Toronto I need to be in. If the price is right, I’d definitely stay here again — just be prepared for the possibility that you’ll have to spend a week (or more) working on minor accounting errors. Have you stayed here before? Did you have any accounting issues? Are you surprised when you don’t see a gross stain on the bed linens, like I am (kudos Marriott Bloor Yorkville for having clean bed linens)? Last February I took a class at the Chopping Block called Midnight in Paris (read about that class here). I loved the class and make the recipes from the class all the time. Well, most of the recipes. 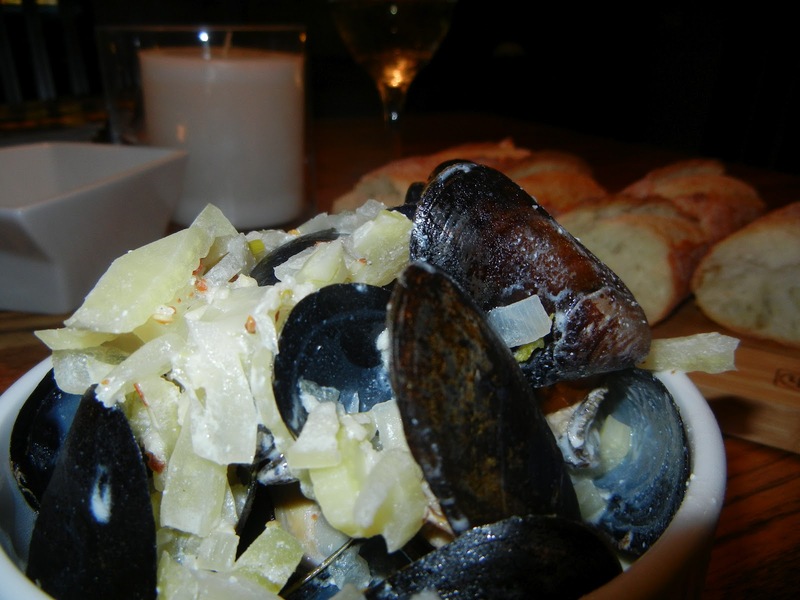 I never made the Mussels Steamed with Fennel and Creme Fraiche…until this past Saturday. I had never made mussels before (other than in class, of course), but since I’m pushing myself to eat more seafood, I figured now is a great time to give it a try. I stopped off at Whole Foods and picked up 2.5 pounds of mussels. I was making dinner for me and my mother — and 2.5 pounds was a pretty filling amount for the two of us. I used the Chopping Block recipe exactly (just scaled up slightly for the extra mussels). Heat a large heavy pot with a lid over medium heat and add the olive oil. 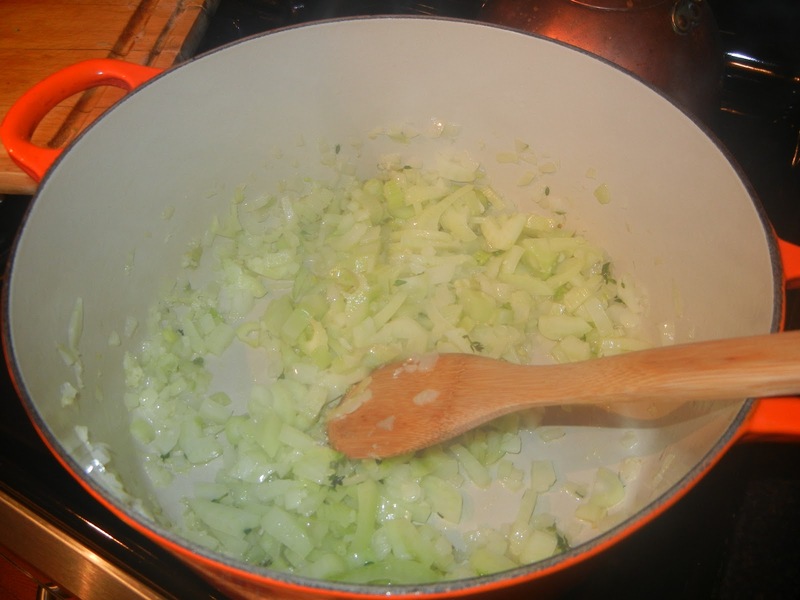 Gently saute the fennel, onion and thyme until softened, 5 to 6 minutes. Add the garlic and chili flakes and cook an additional minute or until aromatic. Season with salt and pepper to taste. Add the mussels, white wine and creme fraiche. Stir well and cover the pot. Lift the lid and stir after about 2 minutes and then cover and continue to steam until the mussels are all open, 2 to 3 more minutes. Discard any mussels that have not opened (this is critical). Divide the steamed mussels (for an appetizer into 4 bowls, for an entree into two), or one large bowl. Return the sauce to the heat and simmer until slightly thickened. 1 to 2 additional minutes. 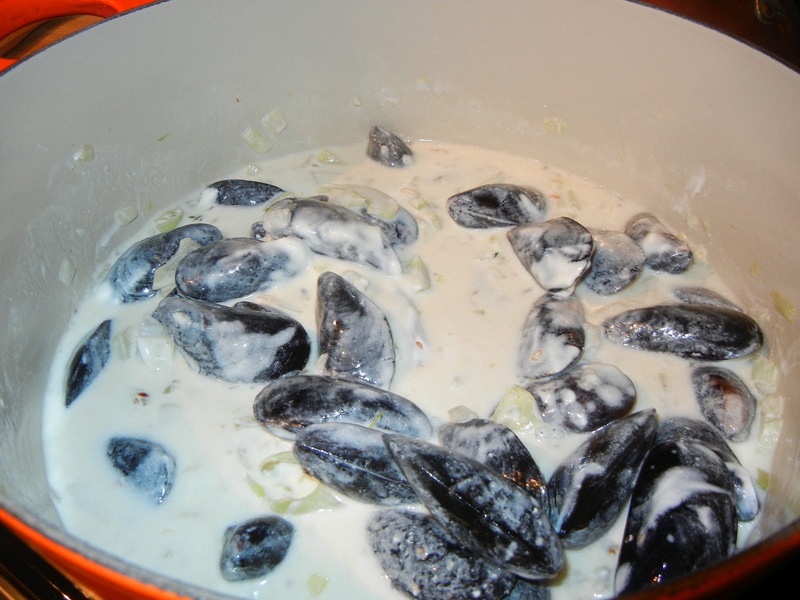 Season with salt and pepper to taste and pour the sauce over the mussels. Garnish with the fennel fronds and serve with the sliced warm baguette on the side. Whoa. A super easy meal. I was at a loss when I first started this recipe. The mussels need to be scrubbed and debearded. I know we talked about this in class, but I didn’t remember and I sure didn’t take notes. I scurry to the internet to find the best way to start. 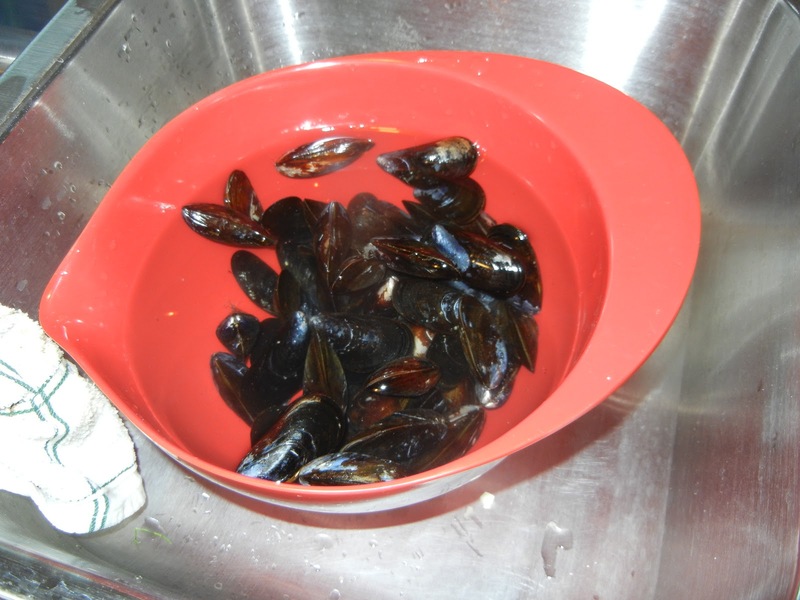 Several websites said to put the mussels in cool fresh water for 20 minutes so they will filter the sand/silt from them. I did that — then continued my research. Uh-oh. Many other websites said not to soak in fresh water as this will kill the live mussels. Dammit. What can you do? I then scrubbed the mussels and removed the beard by yanking it towards the hinge of the shell — which was the consensus on how to do it. I also read that once you debeard the mussel it can die shortly thereafter — so only debeard right before you intend to cook it. My mom, who doesn’t frequently try new food, had never had mussels and she loved it. She even had seconds, which absolutely NEVER happens. The ingredients were very inexpensive — for two of us for dinner it cost less than $10 each — not including the wine. Plated and ready for my belly! Would I make this again? ABSOLUTELY! I plan on using this as an appetizer for Supper Club that I’ll be hosting later this season. What is your favorite mussels recipe? Do you cook them at home or are mussels only a restaurant treat for you? 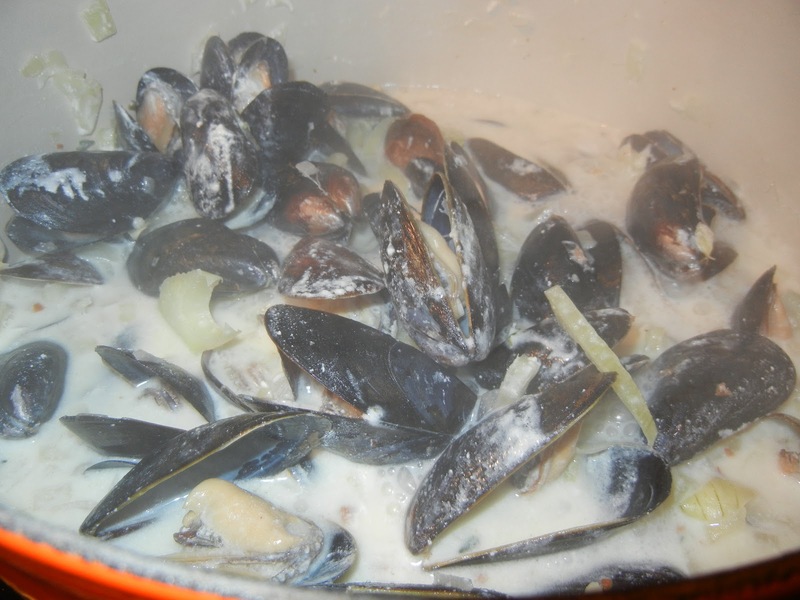 How did you learn how to prepare the mussels? To soak or not to soak? My first taxi experience with Uber last week was great. I was pretty stoked about my first ride. I used the service a couple times since the first run and had great success…I then tried the service again on Thursday — with much different results. I had to run to the office from a meeting across town (to pick up laptops, etc) so I order a taxi via Uber, which was set to arrive in 5 minutes. After a while I got another notice that the taxi would arrive in 2 minutes, then that it was arriving. The app then failed, so I couldn’t get the taxi number, not that it really mattered. I was standing directly under the address sign on the building where the taxi was supposed to meet me. No taxi was anywhere near. The driver called me saying he was here. He wasn’t. I asked what his cab number was – I couldn’t understand him. I even asked him to text me his taxi number – no good. After 10 more minutes of trying to track down the driver, I decided to skip it and walked a few blocks to get another cab. After about 20 minutes I get an email indicating my trip was complete. The trip I never took. He charged me just for the basic fare. This was frustrating. But at least he didn’t try to scam me (by pretending to drive me to ORD, or a far flung suburb). I decided to email Uber and explain the situation and ask them to reverse the charges. I was prepared to dispute the charges (a whopping $3.40) on my credit card if Uber was uncooperative, but the Uber team responded to my email in less than 24 hours and took care of it. So, what’s the moral of this story? Uber isn’t perfect. 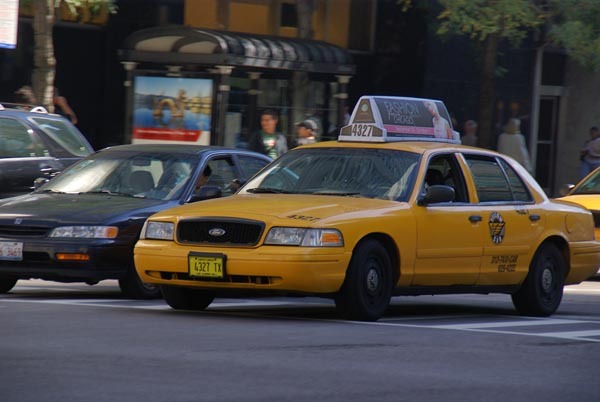 It is a service that relies on independent taxis to provide their service. The thing they can control is the customer service they provide — and Nicole solved my problem and did it quickly. Do I wish this service was more perfect? Of course, but the idea of not having to fight with the taxi driver just so you can use a credit card is worth the little hiccups I’ve experienced. What has been your experience with Uber? Is it better than you expected? Do you find value in the service? 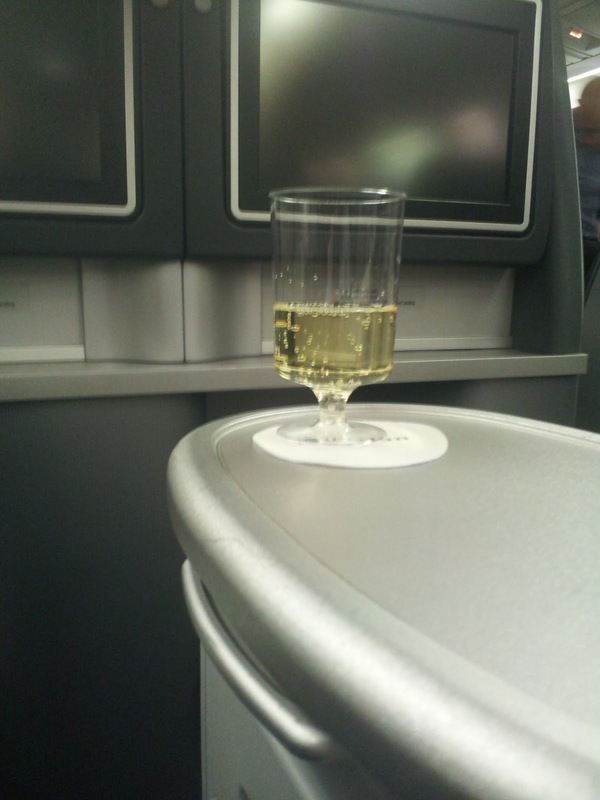 The best travel money I ever spent was upgrading to BusinessFirst on United. I am sure you all think that I’ve absolutely lost my mind. How can a BusinessFirst Seat on United be anything special? Well, this was my first trip ever flying in a premium cabin on an international route (other than to Toronto, which doesn’t count from Chicago). 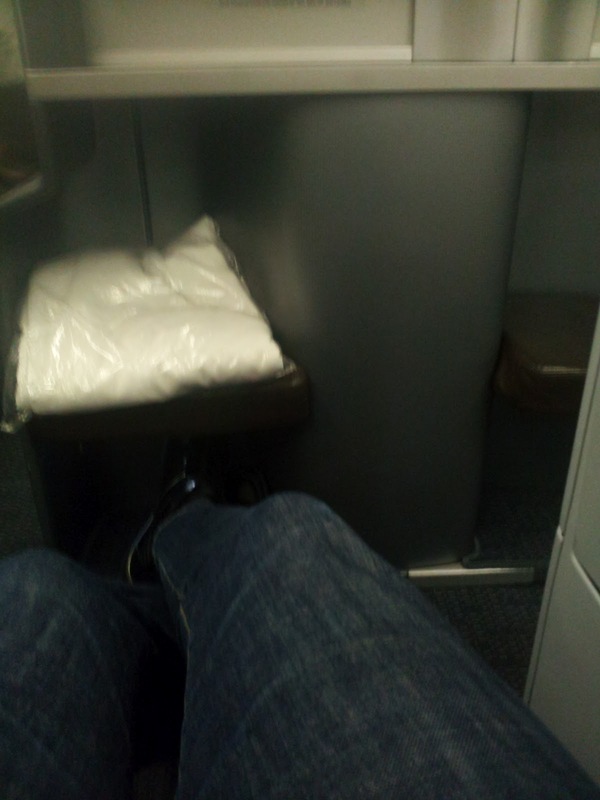 I decided to use the cash and miles option to upgrade my Exit Row seat to BusinessFirst for two main reasons: 1) To try something new and 2) Since I would have only 48 hours in London, I wanted to hit the ground running after getting as much rest on the plane as possible. I cashed in 20,000 miles and $550 to upgrade one way. Not cheap, but I wanted to give it a go. Plus I have more than enough miles. The flight number to London started in Denver and connected in Chicago (with a plane change). The Denver flight was cancelled and according to the gentleman at the ticket counter, a large portion of the flight was starting out in Denver. Our flight ended up being pretty empty. 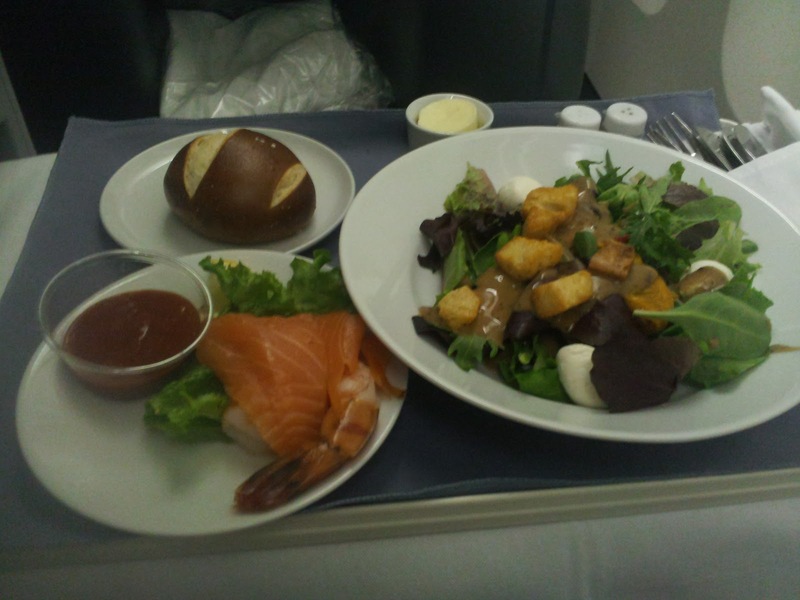 When I chose my seat, weeks before departure, the only thing available was a window seat or a window or aisle near the galley/lav. My ideal seat would have been a center section seat — since the BF cabin is laid out in a 2-2-2 configuration, a middle section allows you access to an aisle and no real possibility for someone needing to crawl over you, thus allowing the maximum amount of sleep possible. On this trip I was traveling with my messenger bag and my 21″ Roller Suitcase. I didn’t realize that a 21″ carry on wouldn’t fit in the center overhead bins on this 767. I struggled putting my bag in the bin — then I finally gave up and moved the bag to the exterior bins – where there was no issue stowing my bag. The seats were pretty comfortable and I had plenty of leg room. One issue I had with the seat was no in seat storage. I like to put my tablet, iPod, headphones and magazines in the seat pocket in front of me. These don’t exist in BF. There really isn’t any secure place to put these items. They either go in your lap, or on the floor (until the Stew yells at you). 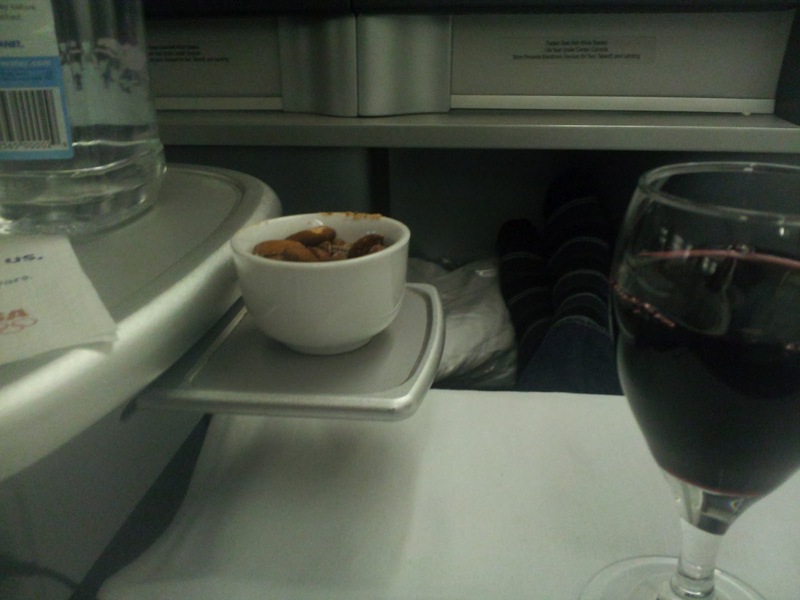 Once I put my bag away, the Stew was immediately upon me, offering water or champagne. Is there really a question as to what I selected? 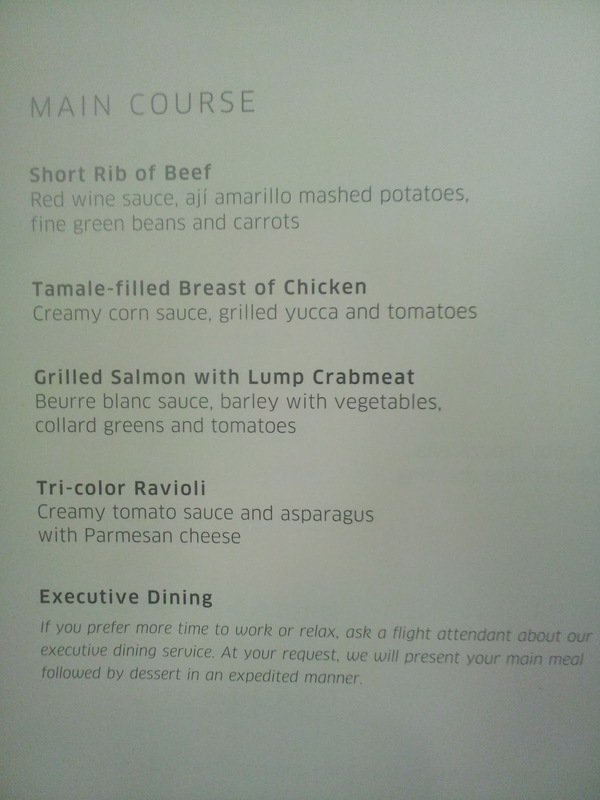 Once the champagne was delivered another Stew handed out the menus and shortly thereafter tossed us the amenity kits. He brought these kits around on a tray but just threw them at us – not even handing them to us. I tossed mine onto the small shelf in front of my seat. I immediately check the menu to see what we are queued up for — I also snapped a picture and send it to MS. I was in hog heaven at this time. 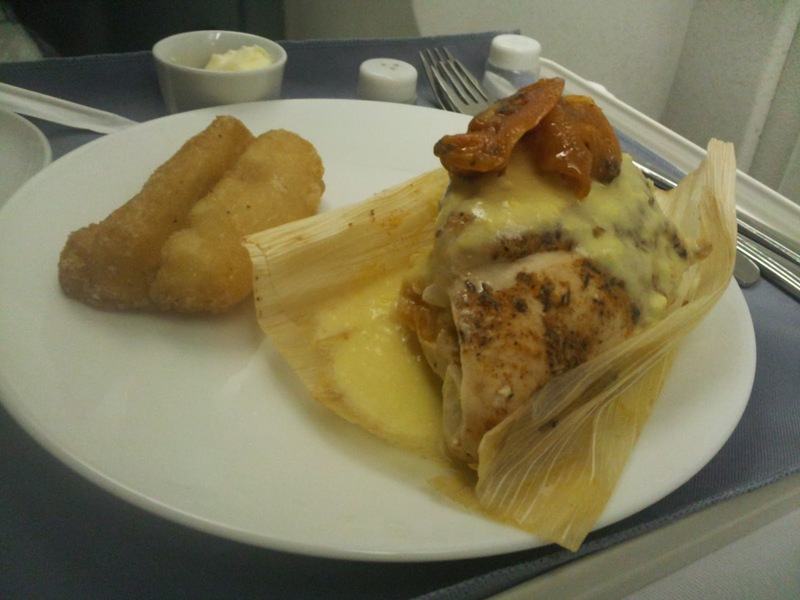 I was so excited, my first flight in Business I couldn’t wait to experience everything coming my way. I then heard the door close. The BusinessFirst cabin was about 50% full and we were ready to make a move. How exciting. I immediately moved across the aisle where both the window and aisle seats were empty. This was a Rear-Facing seat. I’ve had several friends say they can’t comfortably fly in a rear facing seat, but I had no issues. As we pull away from the gate, the first Stew distributes newspapers and magazines. After a short taxi and takeoff, we are en route to London. As we pass 10,000 feet, the Stews spring into action and take drink orders and deliver warmed nuts. I asked for the Côtes du Rhône and the Stew says they aren’t serving that on this flight. I asked for a red wine and she asked what I wanted to drink. I again asked for the Côtes du Rhône. She said they didn’t have any, even though the menu clearly said they did. I said, I wasn’t too keen on the Malbec, but would like to try the other red. She showed it to me — it was the Côtes du Rhône. I told her again, I wanted the Côtes du Rhône and when the Stew said she didn’t have any, I pointed out the type of wine on the bottle. She corrected my pronunciation — it’s evidently called a Coats Du Ruin on United. Good to know. To start I had the only option, the Chilled Appetizer, which was a piece of salmon and a bit of shrimp, served along side a Fresh Seasonal Greens salad. The salad came pre-plated, but the dressing was added table…er, seat, side. This wasn’t remarkable, but it was definitely the nicer side of acceptable. Honestly, I was torn on the dinner options. Do I want the beef or the chicken. Both sounded very good to me. I decided to go with the chicken as it has a Latin Flair. It was so freaking dry and really lacked any flavor. 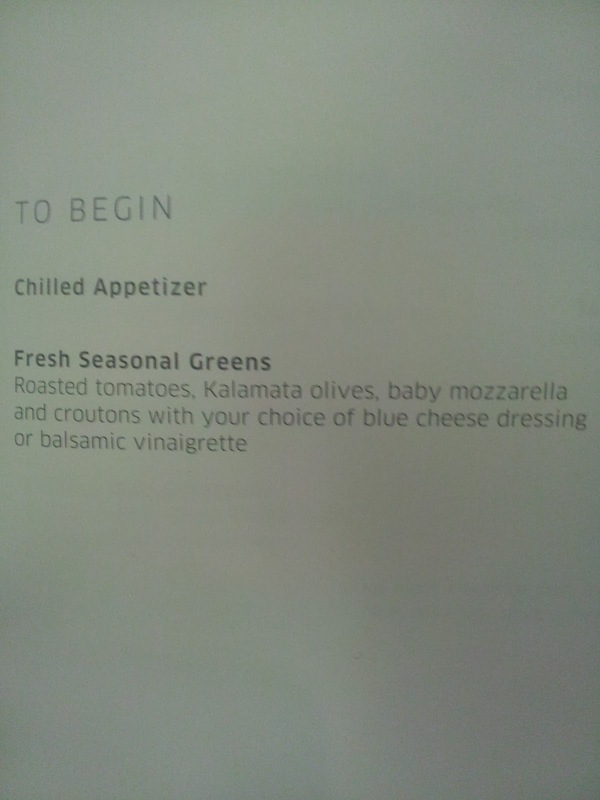 I really had unreasonable expectations with this meal. I was having such a great time so far on the flight and really let myself forget where I was. There were two options for dessert, a cheese plate and a sundae. When the Stew stopped by to ask what I wanted I said both sounded good and asked for her recommendation. She smile, winked and said, try both. This really was my plan from the beginning, but I wasn’t sure if that would fly or not. I know on international carriers you can do both, but sometimes domestic carriers (even on international service) can get a bit up tight. 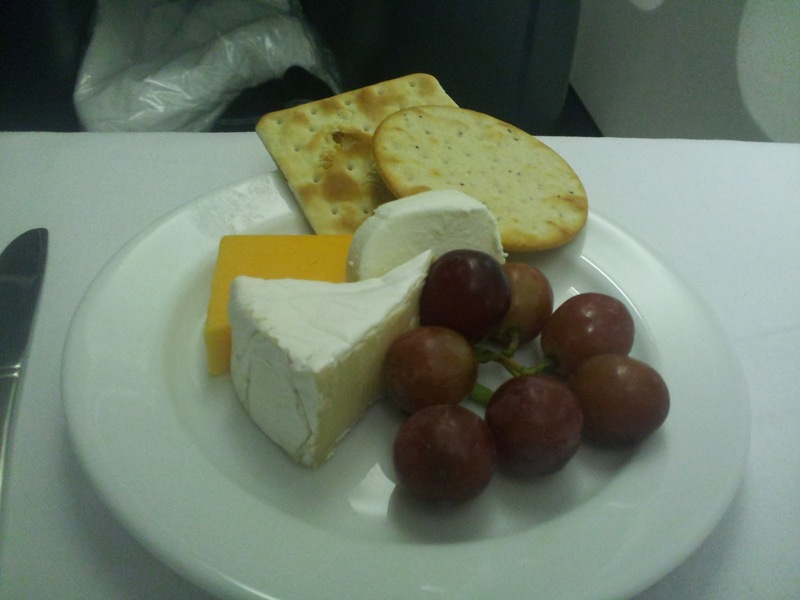 I started with the cheese plate and a glass of port. Once I devoured the cheese, I saw the sundae cart wheel down the opposite aisle. It looked pretty damn good. The other Stew serving BF took my plate, refilled my port and walked away. The first Stew who suggested I try both came back by — looked at me and kept on walking. I asked her about the sundae and she said “oh, you’ve already had the cheese, right”. After I confirmed, she walked straight back to the galley and dumped the two ice cream sundaes on her cart, right into the trash. How tragic. If I had known I would have gotten only one dessert, I would have gone for the ice cream. After dinner, the Stews distributed a bottle of water and headed back to the galley to sit and relax. I put my seat into the bed position and started watching a film. During dinner I watched the new Sherlock Holmes sequel. It was pretty decent. Once dinner was over, I put on a film that I had already watched — The Best Exotic Marigold Hotel (which I really liked). I watched this film and slept. I slept off and on for about 4.5 hours. I woke up about 20 minutes before breakfast was served. I watched a couple TV shows (Criminal Minds, Big Bang Theory and some British show that was tolerable) during breakfast. 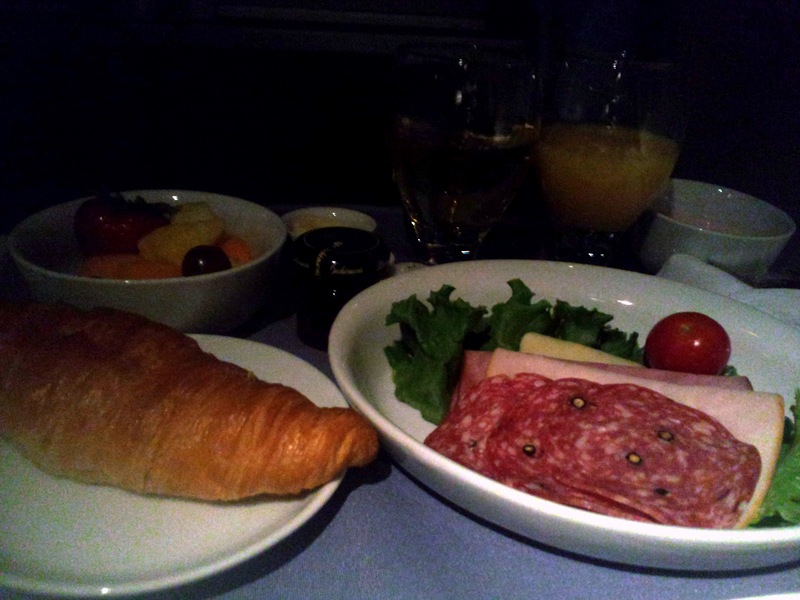 Breakfast was a simple croissant and some meats, cheeses and fruit. Pretty standard. 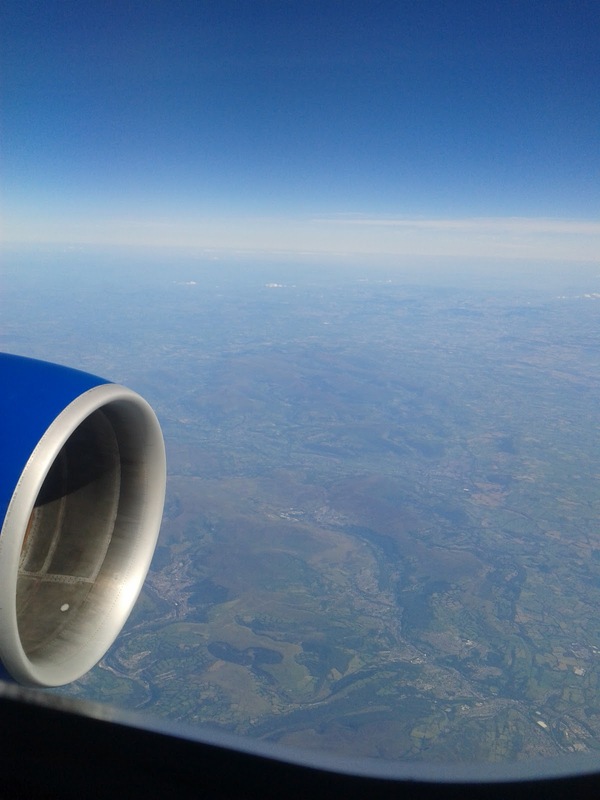 I took this quick picture outside as we were approaching Heathrow. I love London so much – it is an amazing City and has several really dear friends of mine. Heathrow is full of opportunity — you can fly anywhere in the world from Heathrow, it is just so exciting for me. I know, I’m a nerd. 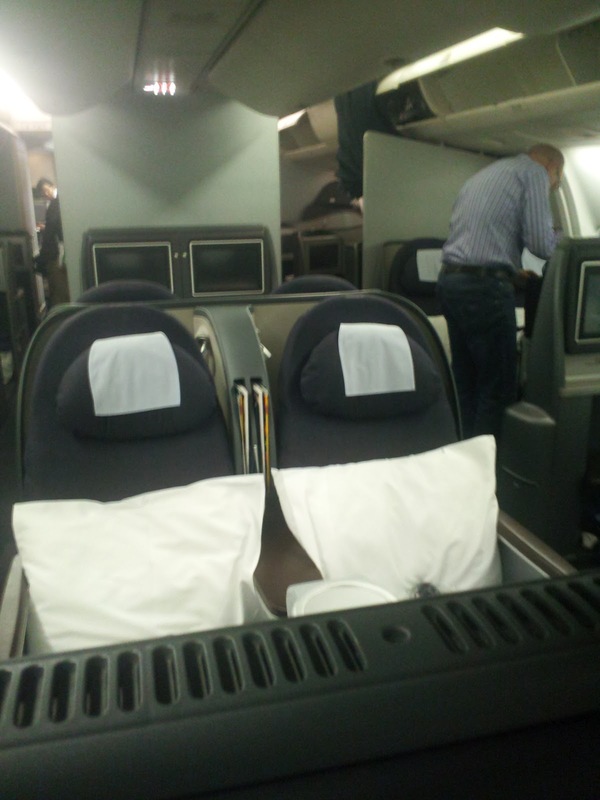 The flight to London is pretty short from Chicago and this flight was quite empty. I am pretty sure a flight in coach would have been perfectly comfortable. I’ve done it several times before, but the whole BusinessFirst upgrade was a fun little treat for me. Would I fly BF every time I fly internationally? Yes, if I could afford to do so — which I really can’t. Have you flown United’s BusinessFirst before? Do you fly BF if on flights that are less than 8 hours? What is your magic time frame where coach just won’t work? Do you think the cash and miles option is a good value? Where is your favorite BF seat on United? Are you an Aisle or a Window Seat person? The Olympics were never really high on my list of things to do before I die, but London is one of my favorite Cities and I have several friends who live here. 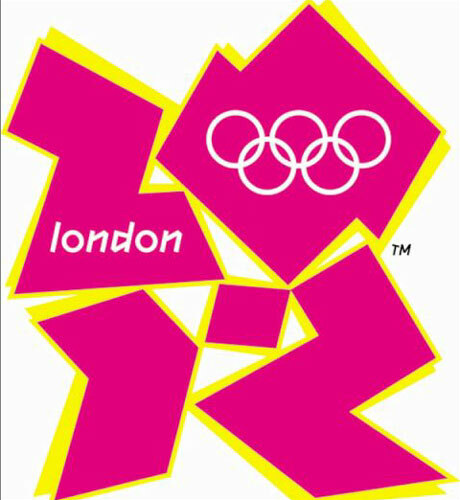 Add these pieces together and I have to visit London during the games, don’t I? Since we got back from our Pacific Northwest Road Trip just 4 days before I headed off to London, I wasn’t “needing” a vacation of course. I had been to Barcelona before too, but wasn’t a big fan. MS loves the City and wanted to show me his Barcelona – I’m always up for a trip. Sit back and enjoy the read.